Let me first start off by stating that this information is not 100% applicable nor 100% true in ever case known to man. This is just the test data that I logged during my testing period in my rifle. Many of you may experience different results and I urge you to gather your own test data. By doing so, we can compile a more accurate set of data dependent on so many variables. Also, this is a 100% independent experiment. I do not work for nor am endorsed by any company or product that I talk about from here on out. 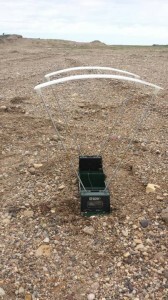 I came to the start of this test because I was shooting in the 2014 ND state F class championship several weeks ago. During the Palma COF on Saturday, everything went as planned. Once Sunday rolled around however, everything fell apart for me in the 1000-yard state championship match. The conditions were less than desirable due to 15-20 mph full to half value shifting winds. However, there were several state records shot that day so I knew that it was not impossible to shoot well in the conditions. I noticed throughout the day that I would get vertical flyers quite often. Meaning my shots felt great and they broke well too. But, my target would prove to be anything but great. I would get a 1-2 MOA vertical shift every 3 or 4 shots. By this I mean that I would send 4 shots in a nice vertical pattern and then my 5th shot would be 1 moa high. I would send another using the same POA thinking that it was something that I did and that shot would land 1 MOA high as well. Then I would dial down 1 moa to correct and my next 3 shots would be 1 moa low. I was right in the middle of “chasing the spotter” as they call it. I am new enough at this game to know that my wind spread would be all over the place given the conditions, but I was certain that my elevation should not be so sporadic. I took care to load every single charge for this competition within .1 of a grain on my RCBS charge master. I was dealing with top-notch components and loading equipment. 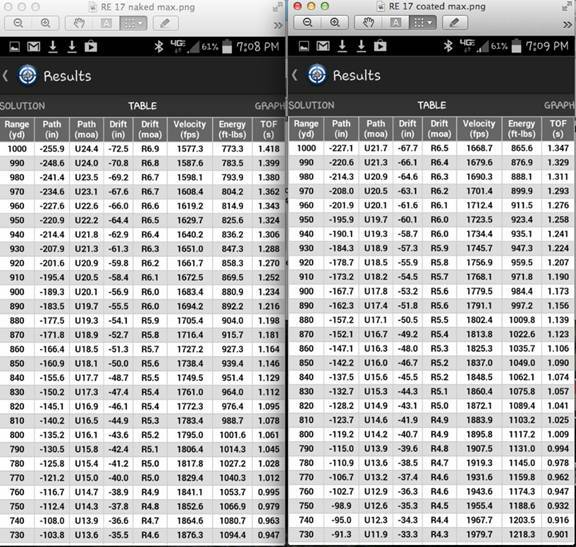 Not only that but my recent load development for my 6mm AR turbo 40 was done with the exact same equipment and I was getting an ES of 17 fps and a SD of 5 with the developed load. I scratched my head for a couple of weeks thinking is it my gun, my loads, or me? I know that my gun is a ½ moa gun when I am doing my part so I threw that out of the equation. That just leaves the environment, my loads, and me. I took my Chrony out yesterday to record the velocity of about 10 of the remaining match loads that I had left from the competition. To my surprise, I was getting an ES of 103fps! No wonder I was 1-2 MOA off at 1000 yards. 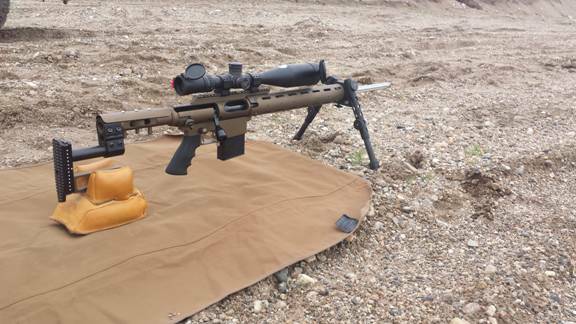 You can’t expect to shoot good at 1000 yards with and ES of 103 fps and that’s a fact. Even when I took out the highest and lowest numbers from the 103 fps data, I was still getting an ES of around 70 fps, which is still sub par by the most minimal of standards. This leads me to believe that the reason is somewhere in my equipment being it in the load or the gun. Up to this point, the only powder that I had shot in this rifle was reloader 17. Just about everything that I could round up via the internet stated that the 2 go to powders for the 6.5mm Creedmoor are H4350, which I have not been able to find in 6 months, and reloader 17, which I happened to have 15 pounds of. Luckily the local sporting goods store had several pounds of H 4350 and I picked them up for this test. My initial thought was that maybe for some reason my barrel did not like Reloader 17. I would test this two ways. 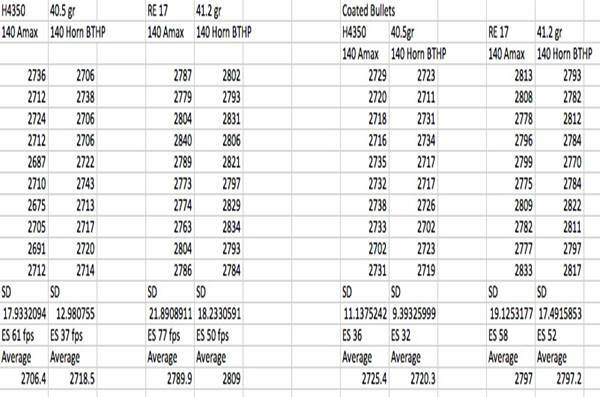 1, I would load a set powder charge of H4350 in the exact same brass with all of the other components being the same and run 10 rounds through the chrony to see how the SD and ES stacks up to the horrible ES and SD of my Reloader 17 match rounds. 2, I would run a box of Hornady match grade factory ammo and chrony them as well. 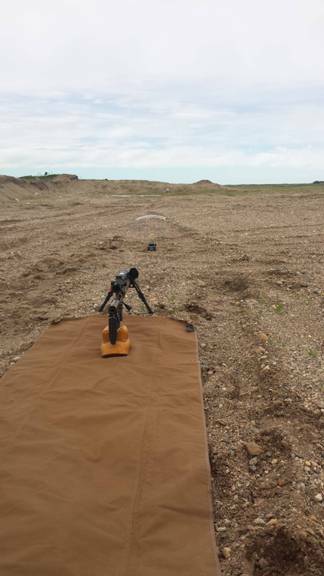 Also, I would run this test with the 140 gr Amax and the 140gr Hornady BTHP. I wanted to keep all things equal so I loaded up a fresh batch of each and shot them during the same time of day so the environmental conditions would be virtually the same throughout the whole test. The test consisted of checking the velocities on 10 rounds per test group. All rounds were built with the same Remington large rifle primers. The cases were all trimmed to 1.910” on a Giraud trimmer. All cases had been fired 3 times. All cases had been full length resized after every firing and the shoulders had been bumped only .001” each time. The neck tension was measured to be .0025” on several of the loaded rounds as well. I wanted to keep all variables the same. Before testing, the barrel was cleaned then fouled with 10 shots after which I started recording data. The testing gun is an Eliseo RTS with a trued Remington action and has a 26” Brux 1:8.5 twist SS varmint barrel and a jewel trigger. The gun had approx. 1800 rounds down the tube at the time of testing. 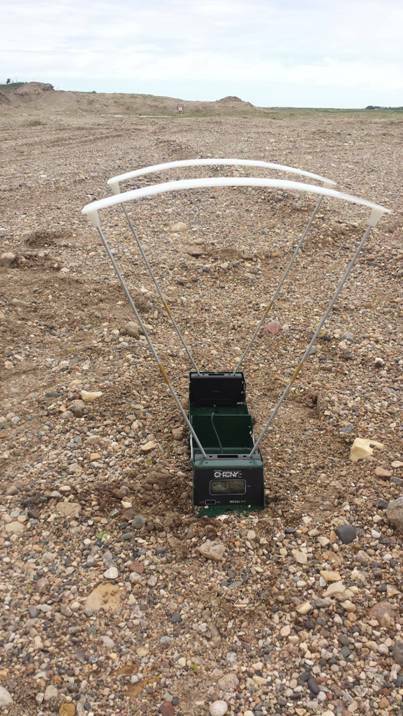 Shooting conditions Altitude 2192, Barometric pressure 29.829, temp 66.2 degrees F, Humidity 58.3 %, wind calm. I was still unhappy with the results. 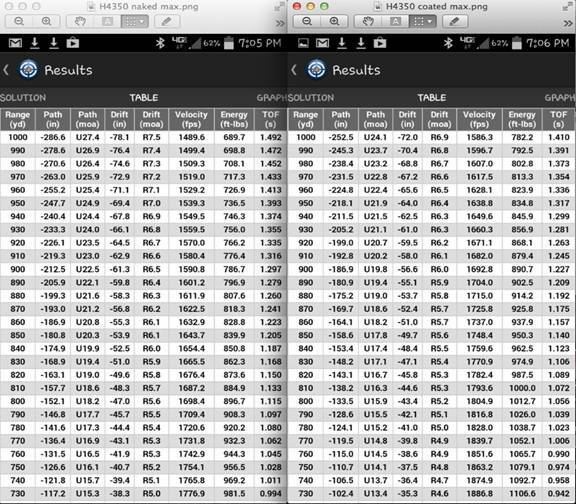 As you can see, The H 4350 did perform a little better and it did lower my ES and SD. However, for my case, I am shooting for an ES of less then 10% of the average velocity and a SD of less than 6 fps. In both cases, the barrel seemed to like the Hornady BTHP a little better than the Amax’s. 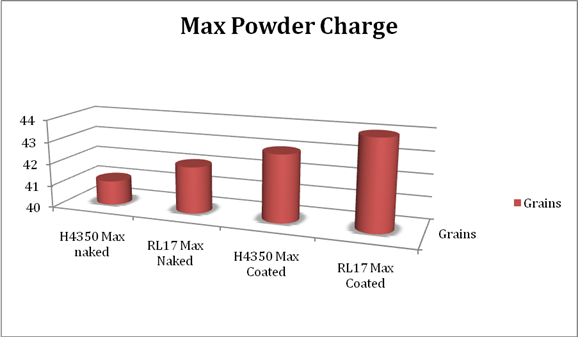 It should be noted that I am using a charge that is .8gr below book max for the RL 17 and a charge that is .5 gr below book max for the H4350. 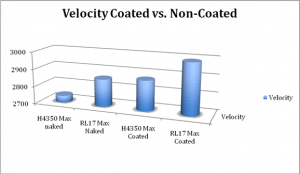 As the graph shows, RL 17 has proven to consistently provide faster velocities than H4350. Since I already had this data recorded, I thought it would be a great time to try another test as well. At this point, I had almost half of the data that I needed to test out a newer bullet coating called Hex-Boron Nitride (hBN). 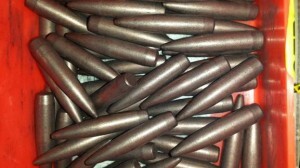 My father has coated his bullets with Moly for many years and has seen benefits from velocities. He got me a package of hBN from www.bulletcoatings.com as a gift and I have been skeptical about it since the beginning. My thoughts are, if it is as good as they say it is then why isn’t every F class and bench rest shooter out there using it? I have not seen one person using a coated bullet on the firing line. There is a pile of information out on the Internet about Moly because of the Moly craze but it is hard to find much on hBN. Hex-Boron Nitride offers several benefits over moly. hBN has a lower coefficient of friction than Moly. This is saying that hBN has the ability to cause less friction when your bullet is running down your barrel. Another benefit that hBN offers is that it has a much higher temperature stability than Moly as well. Boron Nitride is stable up to 1000 degrees Celsius in the air, and 1400 degrees Celsius in a vacuum. Moly on the other hand has a temperature stability of 400 degrees Celsius. This means to me that the Boron will stay in tack at a much higher temp than Moly will. You coat bullets with hBN in the same way that you would coat them with Moly. I use a tumbler and a hard media like stainless steel BB’s with a set amount of hBN and let the bullets tumble for an hour to get nice and coated. After coating these bullets, I noticed that Boron Nitride is much cleaner to work with than Moly is. Boron Nitride is also known as “white graphite”. 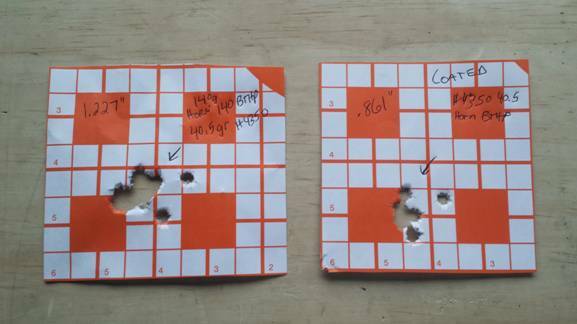 Since I didn’t get the lower SD and ES from my testing of the 2 different powders that I was looking for, I was wondering if I were to try the same test with hBN coated bullets what would I find? If I could get my SD and ES down even lower by using coated bullets, then It would be worth it to me to coat the bullets since I already had the Boron Nitride sitting in my reloading room. 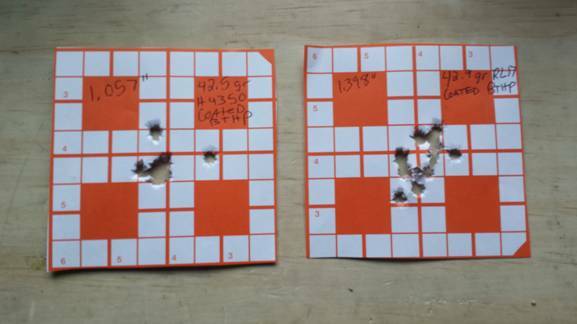 I decided to run the exact same test as I did previously in this article only this time I would use coated bullets. 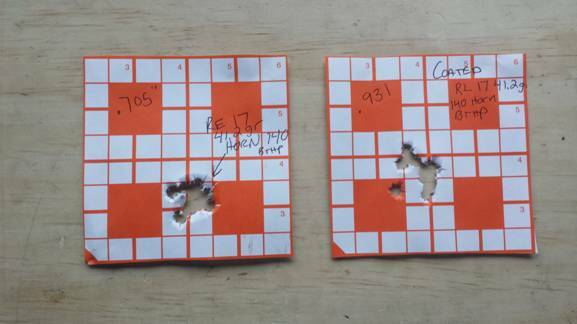 Shooting on the same day only a couple of hours later, I ran the EXACT same test only using hBN-coated bullets. Before this test, I cleaned my barrel and then shot 10 fouling shots only this time I used coated bullets for my fouling shots. I figured that I would need to get a nice coat of Boron Nitride in the barrel before I could gather data and feel like I was getting correct numbers from the Boron. Here are the results. 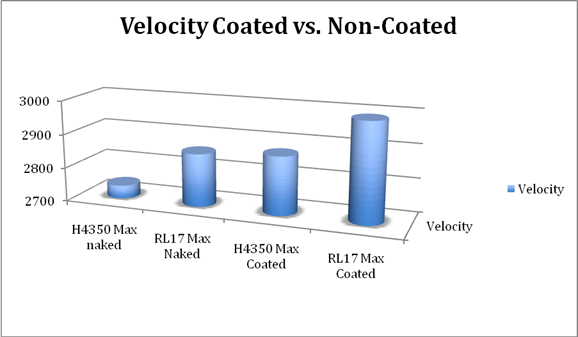 Also, look at the velocities of the coated vs. the non-coated. There is hardly a difference at all. It would not be enough in my opinion to justify the extra step of coating the bullets in the tumble. So, the Boron Nitride doesn’t work as advertised right? WRONG! While talking with Eric from E.S. Tactical, I learned that this is not the way that running a coated bullet works. I was under the impression that since you lubed up the bullet, and there was lube in the barrel that it created less friction for the bullet so the bullet should exit the muzzle at a faster speed. I was mistaken however. The way that it actually in supposed to work is that since there is less friction in the barrel that means there will be less pressure as well. In fact Eric was surprised to see that my coated bullets were still running close to the same velocities as the non-coated bullet. In theory, since there was less pressure in the barrel and chamber, the bullets should have been exiting the muzzle at a slower speed since the powder charge had not been altered. I learned that with bullet coatings since you are providing less friction thus creating fewer pressures, you would now be able to pack more powder in the case to make the bullet velocity higher before reaching pressure signs. He had guessed that I would be able to use somewhere around 2 more grains of powder before reaching my pressure signs by using the coated bullets. 2 more grains of powder are sure to increase the velocity but I would have to test this as well. From previous load testing I knew that I had reached pressure signs in my rifle just about .1-.2 grains above the book’s suggested max charge. And what do you know; I also had chronographed load data for those loads. I set up another test to see if what Eric was saying would be true. In this test I would start at the books suggested max load and I would increase the powder charge by .3 grains and keep on going until I reached pressure signs with the coated bullets. I have to admit, it feels wrong on every level to a reloader to knowingly load up to 2 grains higher of a powder charge in to a case and shoot it when you know from previous experience that you have seen pressure signs close to max book charge. Keep in mind that every variable is still the same. This test was also shot on the same day with the same case and primer etc. With naked bullets, I had seen pressure issues with H4350 with 41.2 gr. 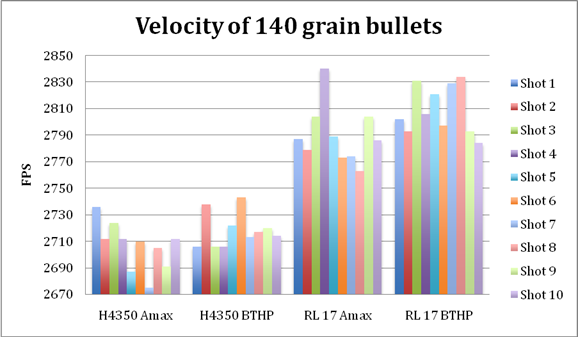 With naked bullets, I had seen pressure issues with RL17 at 42.2 grains. By pressure issues I mean noticeable ejector marks on the case head and hard bolt lift. The primers actually did not show any flattening. 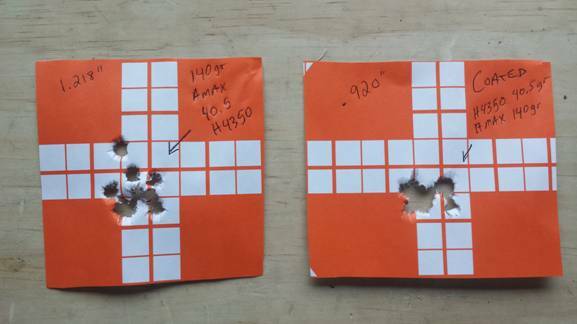 In order to keep the test variables the same I used coated 140gr Hornady BTHP for this test with both powders since they showed a little promise during my earlier testing. What I found was amazing. Not only was Eric right, but also I was now achieving much higher velocities than he had even guessed. I was able to load a full 2 grains higher than my previous tests had let me load to with naked bullets. 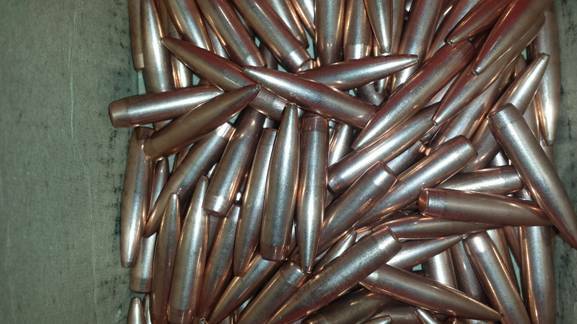 As you can see, the Boron Nitride coated bullets allowed for much faster speeds due to the ability to push more powder down the barrel. Another thing to think about is that in theory if a coated bullet has less friction running down your barrel then it should have less air resistance as well. This means that it should buck the wind a bit better too. In the next two photos I used my shooter app on my phone and entered the max velocity that I could get out of a naked Hornady BTHP using H4350 (2739 fps) on the left side. I then entered the max velocity that I could get out of a coated Hornady BTHP using H4350 (2872 fps) on the right side. I did the exact same thing on the second photo except I used Reloader 17 on the second example (2857fps on the left and 2990 fps on the right). 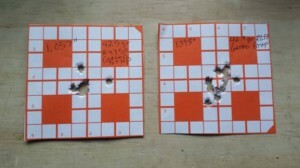 Notice the big difference in bullet drop between the two at 1000 yards! So this should conclude my test right? WRONG again. 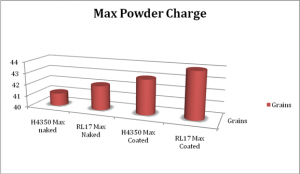 I am still not happy with my ES and SD with either of these powders rather I am using RL 17 or H4350. When looking at the max pressure test that I ran while loading 2 grains higher than the book suggested I want you to look at the H4350 charge of around 42.5 and the RL 17 charges of around 42.6-43.1. It was pointed out to me that when you see very little velocity change in the numbers surrounding the preceding and following charges like this that it is usually a node. This does not necessarily mean that it is your accuracy node but as far as velocities go, it made sense to me. Eric suggested that I run one more test and take the powder charges of these new, faster, coated nodes and see if their velocities are more consistent thus maybe creating a lower SD and ES. 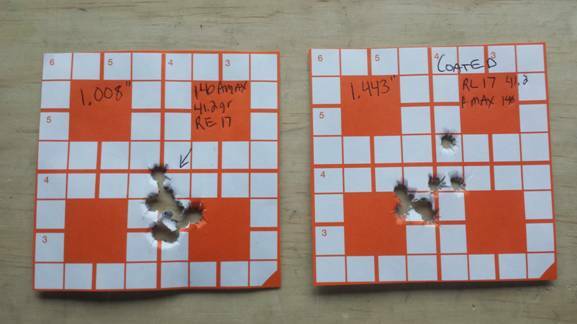 I loaded up 10 rounds of H4350 at 42.5gr using the BTHP still and 10 rounds of RL 17 at 42.9 gr with BTHP and took them out to record the chrono results. Here is what I found. I am happy with the new SD and ES. From the very beginning of this test I was not sure how I was going to get my velocities to be more consistent. Through trial and error and evaluating all of my data and with some insight from a very experienced shooter, I was able to figure something out. I had a lot of fun running all of these numbers and compiling all of the data. 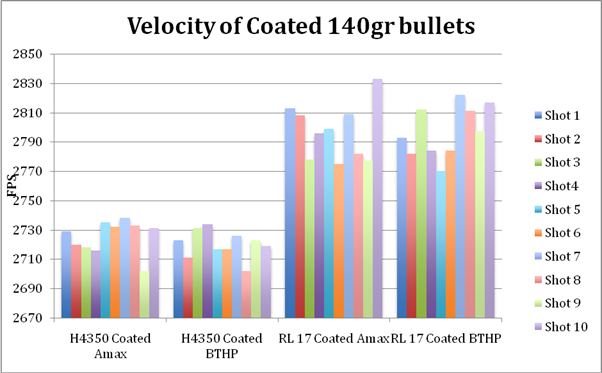 In conclusion, Boron coating your bullets may not be something that everyone wants to do but it proved to help my situation with velocity consistency. Not only are my ES and SD numbers down a lot lower with them but also I am also able to run my bullet at higher velocities now. Some may say that this will cause lower barrel life. I only have probably 1000 rounds left to shoot down this tube before I put my new one on this fall so I am not worried about barrel life. I will shoot out the rest of this barrel using hBN coated Hornady BTHP and will likely stick with the RL 17 since I still have a bunch of it left and the data has shown that I can very easily shoot 2900 fps with no pressure signs. Many thanks to Eric at E.S. Tactical for all of the insight! This entry was posted in Reloading, Reviews. Bookmark the permalink. I’m experimenting with HbN now as well. I was curious how your monitoring your neck tension? are you using an arbor press with a force gauge and quality seater die when seating bullets? Did you turn the necks of the cases? Your lower ES and SD maybe due to the lubricity of the bullet in the neck. Just a thought.